From time to time I like to update site readers on what lenses are available in the various mounts. 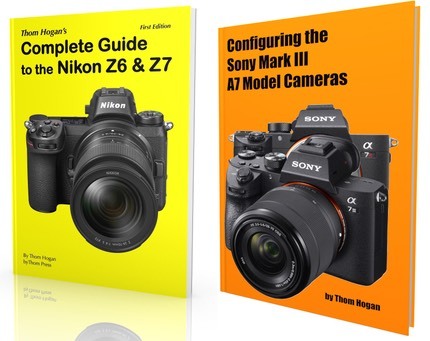 For current mirrorless owners, it’ll give you an idea of how your system stacks up against the others, plus remind you of what you’ve got available. For those thinking about purchasing a mirrorless camera, this allows you to quickly compare the potential systems for suitability. Notes: The Pentax Q line is tough to nail down due to the sensor size change. I’ve moved these lenses to where I think they approximate with the current Q cameras. The 300mm equivalent for m4/3 may not appear, while a 600mm equivalent should. As usual, I’ve had to round a few focal lengths here and there to fit into established 35mm equivalents. I’ve not listed third party options here, but they tend to mimic what you see here: Fujifilm, m4/3, and Sony get more support from third parties, while Canon, Leica, Nikon, and Pentax don’t get much, if any. Samsung falls somewhere in the middle. Quite obviously, m4/3 still has a broader and deeper choice than the other mounts, partly because we’ve got two manufacturers—Olympus and Panasonic—contributing to the available lenses. 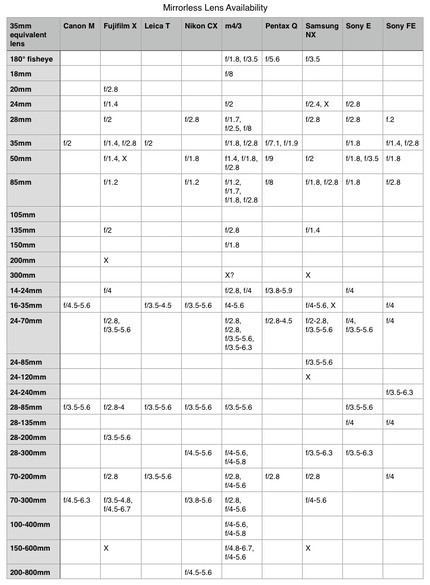 While there are gaps in the m4/3 lineup still, for the most commonly used focal lengths there is plenty of choice. Fujifilm and Samsung have been filling out their lineup quite well, too, though each still has a few significant gaps they still need to fill, particularly when it comes to telephoto lenses. Surprisingly, the E/FE mount has a lot of near duplication in it. The original Sony E-mount is getting less focal length diversity than you’d think with the introduction of FE lenses, as the prime focal lengths pretty much just stack up on each other.